Sometimes I’m asked to review items and I have to turn the chance down because it’s an item that I wouldn’t otherwise have used or needed. Then there are items like these that I was literally desperate to try because the items were on my shopping list anyway. 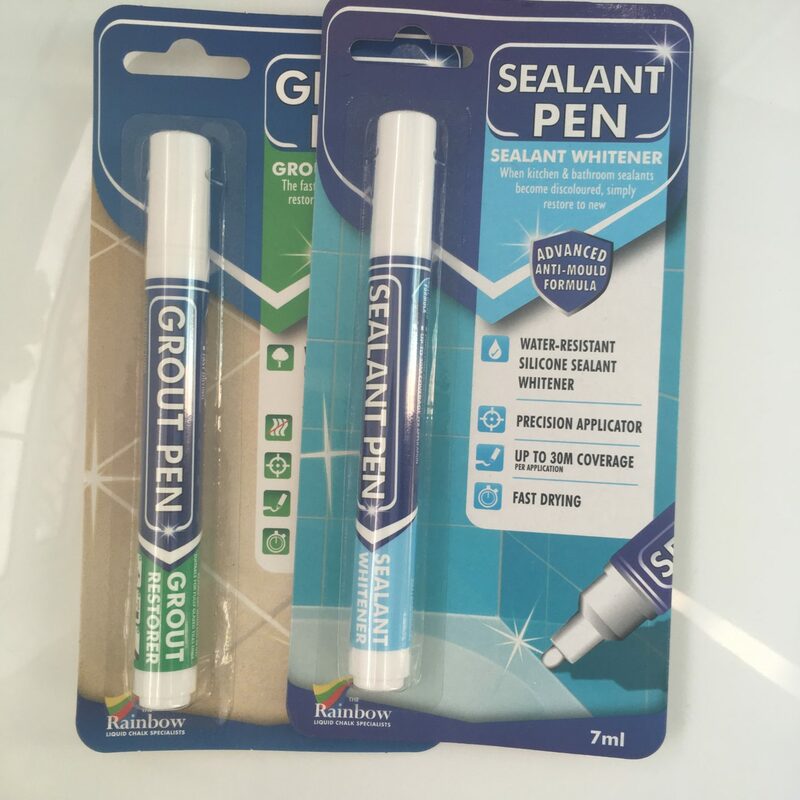 Today I’m reviewing the Rainbow Chalk sealant pen and grout pen. I’ve received a gifted free sample for the purposes of review but the opinions are my own. First let’s tackle the sealant pen. The first thing I did was try it on my bathroom seals but I just replaced the seal on my bath so it doesn’t tell you much about the effectiveness, so I used it on my conservatory instead. It’s recommended for the kitchen or bathroom, but I think it could be used anywhere that you have white silicone sealant. The pictures shown are taken by me or my husband and are from my home. It’s difficult for me to show these pictures because nobody wants gross photos of the less than perfect parts of their home on the internet, but let’s be honest, very few of us live in sparkling mansions and we all have to clean and repair parts of our homes. I wish I had a house like Mrs Hinch, but I don’t. There’s no point being embarrassed about it, you just clean it, fix it and get it dealt with. That’s where these sealant and grout pens come in. Ok, so the idea behind this is that it’s meant for tackling discoloured sealant that isn’t so bad that it needs to be replaced. I was glad to see the anti-mould properties mentioned on the box because that’s a major concern for me. In my conservatory we don’t have heating, so we rely on opening windows and keeping the place ventilated. That’s not always something we remember to do, especially in winter when we hardly use the room. As previously mentioned this is designed for kitchens and bathrooms, two rooms where moisture and dampness can be issues. I’d recommend giving the sealant a good clean first before you do this, so you’re not just covering up any mould. This also claims to have a formula that prevents mould returning. I’ve only had this for a couple of weeks so again, I can’t confirm that is true. Time will tell! This gives up to 30m of coverage but I don’t have 30m of sealant in my home to be able to test that claim, but I can confirm that I probably covered about 10m and didn’t find that it ran out. The sealant pen does come in the shape of a regular pen but you have to press down on the nib to get it to work. It won’t just flow like a biro. You also have to shake the pen to get the ink inside to blend. The instructions said that it’s best to depress the nib on a flat surface first to start the ink flow. I found that I had to keep doing this. If I pressed too hard on the sealant while using I found it dragged a bit. My sealant wasn’t too heavily stained to begin with and one coat greatly improved the appearance and made it look cleaner and whiter. I added another coat the following day and it looked even better, but the biggest difference was with the first coat. The second coat was more for my own perfectionism. The ink isn’t as thick as I had thought it might be though, so I would say that if you have a heavily stained or darkened seal, you’ll need to use it three or four times to get it looking good. The image below is top half after one coat and the bottom half not done at all so you can see the difference. I think it could do with another application. There’s still some discolouration around the edges. You can use the sealant pen again within an hour and you have to wait twelve hours before getting it wet, but to be on the safe side I’d recommend waiting until the following day. As I said, the ink isn’t as thick as I had thought it might be and to give it a chance to get properly dried, I’d wait. Also worth mentioning, the 30m coverage would have to be taken into account when buying the pens. If you’re covering the seal on two bathrooms, and they’re 10m worth of seal on each, you’ll have to allow for two coats, minimum. So buy enough pens for all the coats before you start the job. The next pen was the grout pen and this really impressed me. I’ve got a mostly tiled bathroom and every spring we have to re-do the grout with a grout pen. It’s become part of the routine of this house now. The grout always gets discoloured, no matter how clean we keep it and we don’t even realise until we get the grout pen out and give it a coat of white just how dull it’s gotten. This one gives 60m of coverage, which is good because I have loads of tiles. But the great thing about this was it only needed one application to come up looking really good. It dries after about five minutes and it’s recommended you wait six hours before getting it wet. I would agree with those times, given my own experience with this grout pen. This also has an anti-mould formulation which is really important for me, especially in the bathroom. Similar to the sealant pen, you have to depress this a few times on a flat surface to get the ink to start flowing. However, it has a different surface to work on, so you can depress this slightly harder and get a better flow going than you can with the sealant pen, because it’s being applied to a hard surface. Do you know what I mean? I was a bit worried I was going to puncture the sealant if I pressed too hard (and did a little bit at the start) but with grout, you don’t have that worry. Above is my before pic. My bathroom tiles are cleaned and scrubbed regularly and we still get this discolouration – because it’s a bathroom that gets used by a house full of people every single day. This was before I gave it a bit of a scrub with some anti-mould spray and applied the grout pen. Below are the final results, after just one application. I’m really impressed and would definitely buy the grout pen again and keep it handy for touch-ups. My verdict is that I would definitely buy both products again because they made a difference to how my home looks and you can’t put a price on seeing your house look cleaner and tidier, but I really fell in love with the grout pen because the results were instant and drastic. If you’d like to check out these products, you can check out the Rainbow Chalk website and the grout pen and sealant pen pages in particular. There are different nib sizes to choose from and there’s also replacement nibs available for the grout pens. The grout pen I received was £3.50 and the sealant pen was £3.99.